Burbank, CA – September 9, 2015 -- Marvel Music is releasing the soundtrack for Marvel's Agents of S.H.I.E.L.D. physical CD on October 9, 2015. The digital album is available now. EMMY Award® winner Bear McCreary (Outlander, The Walking Dead) composed the music for the series. 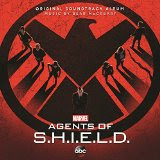 Included on the soundtrack are some of Marvel and McCreary’s favorite cues, including the main title theme, "Aftermath of the Uprising" and "0-8-4," and “Cello Concerto” from the episode “The Only Light in the Darkness,” an episode that centered around Coulson’s ex-girlfriend, a cellist. “My musical fascination with Coulson’s ex began in Episode 11 [The Magical Place]. There was a scene where Raina mentions The Cellist to Coulson and strikes a deep, emotional nerve,” said McCreary. “I was thrilled as I read the script for ‘The Only Light in the Darkness’, realizing that the episode would not only provide a chance for me to expand the Cellist Theme, but that the character herself would actually play it on screen.” McCreary worked closely with the actress who played The Cellist, Amy Acker, on set to make sure it appeared she was a cello virtuoso. 1. "Agents of S.H.I.E.L.D. Overture"
2. "Showdown at Union Station"
6. "Aftermath of the Uprising"
His out-of-the-box thinking led WIRED Magazine to call Bear McCreary a “Secret Weapon.” His unique combination of atypical instrumental background (he is a professional accordionist) with rigorous classical training prepared him to compose for disparate genres. By the age of 24, McCreary was launched into pop culture history with his groundbreaking score to Syfy’s hit series Battlestar Galactica, for which he composed “the most innovative music on TV today” (Variety). It “fits the action so perfectly, it’s almost devastating: a sci-fi score like no other” (NPR). Io9.com declared Bear McCreary one of the Ten Best Science Fiction Composers of all time, listing him alongside legends John Williams, Jerry Goldsmith and Bernard Herrmann. In addition to earning his first Emmy® Award in 2013, McCreary was voted “Composers’ Choice Composer of the Year – Television” for 2013 by his peers in ASCAP, the first award of its kind. An Emmy® Award winner for Da Vinci’s Demons McCreary also composes for The Walking Dead (which shattered records with 17.3 million viewers for its fifth season debut), STARZ’s debut series Outlander (for Executive Producer Ronald D. Moore who he previously worked with on (Battlestar Galactica), Marvel’s Agents of S.H.I.E.L.D.—the #1 series debut of the 2013 fall season, the STARZ series Black Sail,the Syfy series Defiance, and the feature films Angry Video Game Nerd: The Movie, Everly and Europa Report. McCreary recently earned his fourth Emmy nomination, his first for Outstanding Music Composition for a Series (Drama), with Outlander. About "Marvel's Agents of S.H.I.E.L.D." Joss Whedon, the creative genius behind the feature film “Marvel’s The Avengers,” one of the highest grossing films of all time, and the iconic television series “Buffy The Vampire Slayer,” has co-created “Marvel’s Agents of S.H.I.E.L.D.,” a dynamic, action-packed one-hour drama that brings back Agent Phil Coulson (Clark Gregg) to lead a team of highly skilled agents to investigate extra-normal and super human people and events worldwide. “Marvel’s Agents of S.H.I.E.L.D.” stars Clark Gregg as Director Phil Coulson, Ming-Na Wen as Agent Melinda May, Brett Dalton as Grant Ward, Chloe Bennet as Agent Daisy Johnson, Iain De Caestecker as Agent Leo Fitz, Elizabeth Henstridge as Agent Jemma Simmons, Adrianne Palicki as Agent Bobbi Morse, Nick Blood as Agent Lance Hunter, Henry Simmons as Alphonso "Mack" Mackenzie and Luke Mitchell as Lincoln Campbell. “Marvel’s Agents of S.H.I.E.L.D.,” Marvel’s first television series, was co-created by Joss Whedon, Jed Whedon & Maurissa Tancharoen (“Dollhouse,” “Dr. Horrible’s Sing-Along Blog”), who also serve as executive producers along with Jeph Loeb (“Marvel's Daredevil,” “Lost,” “Marvel's Agent Carter”) and Jeffrey Bell (“Angel,” “Alias”). “Marvel’s Agents of S.H.I.E.L.D.” is produced by ABC Studios and Marvel Television, and is broadcast in 720 Progressive (720P), ABC’s selected HDTV format, with 5.1-channel surround sound. The third season of Marvel’s Agents of S.H.I.E.L.D. premieres on September 29th at 9/8c on ABC. The digital soundtrack is available at digital retailers today and the physical album will be available wherever music is sold on October 9, 2015. Labels: Bear McCreary Joss Whedon Marvel's Agents of S.H.I.E.L.D.